As general dentists, Dr. Juan Anillo, Dr. Manny Anillo, and Dr. Maria Abril-Barsky serve patients of all ages and from all walks of life. Your first appointment will include a comprehensive exam with the dentist and gentle hygiene care. 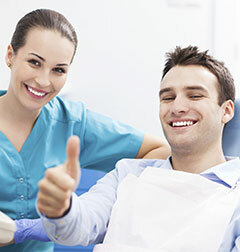 First, our team will assess your gums and soft tissues, existing dental work, each tooth in your smile, and your bite. Digital X-rays and intraoral photographs help us to accurately diagnose problems and explain suggested treatment options. You will always be an important part of the process! A thorough, yet gentle cleaning will leave your teeth silky soft, sparkling, and fresh. If your gums show signs of gingivitis, we can return them to full health and help prevent recurrence. Left untreated, gingivitis can advance to periodontitis, which can cause tooth, gum, and bone loss and has been linked to stroke, heart attack, and other overall health risks. We want to help you keep your smile strong and healthy for years to come, so schedule your initial visit today! If you need a general dentist or cosmetic dentist who will give you a reason to show off your smile, call the Miami dental office of Juan Anillo, DMD, Manny Anillo, DMD, and Maria Abril-Barsky, DMD. Our practice serves patients from the greater Miami area, including those from West Kendall.